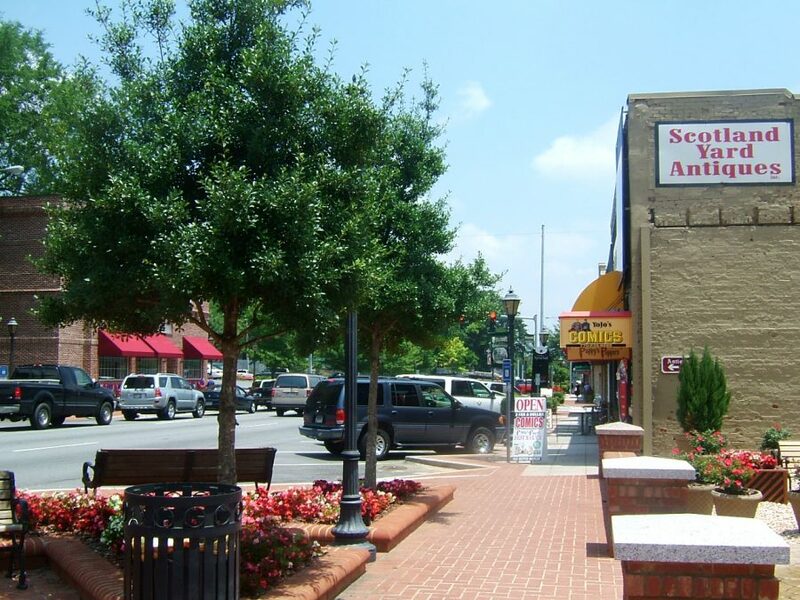 Established in 1821, Lawrenceville is the second-oldest city in the Atlanta area and the seat of Gwinnett County. As you might expect, the city is filled with history that starts with a freshly-revitalized downtown district where a wide variety of restaurants, shopping, entertainment, and sightseeing are within walking distance of each other. Lawrenceville is one of those rare suburbs where the population is not just ethnically-diverse, but also equally dispersed among age groups. It’s an active community with good public schools, several higher learning schools, an energetic nightlife, and a low cost of living, too. The ratio of homeowners to renters in Lawrenceville is evenly split at 50 to 50. Both the median rent and the median home values are lower than the national averages, so this is an affordable place to live if you want to move to the Atlanta area, but are working within a tighter budget. For rent, the average in Lawrenceville is $933 compared to $949 nationally. Meanwhile, there’s a larger divide between the city’s median home value of $154,400 and the national average of $184,700. The most popular home styles here are the contemporary and ranch styles. Lawrenceville offers you the benefit of affordable housing, excellent amenities, and a welcoming and extremely diverse community. It also has an easy commute to Atlanta, and some of the best medical services available anywhere in the country. If you’re looking for a comfortable place to call home that will see to your needs now and in the future, then Lawrenceville just might be the ideal place for you. Lawrenceville is well-served by public transportation with Xpress GA/ RTA Commuter buses and Gwinnett County Transit buses running through the city. However, most Lawrenceville residents prefer to commute by car due in part due to the city having easy access to several major highways, including US 78 (Stone Mountain Freeway), Interstate 85, U.S. Route 29, and State Routes 316, 124, 120, 20, and 8. Residents in the southern portions of Lawrenceville also have access to Ronald Reagan Parkway. Lawrenceville is limited when it comes to walkability, but plans are in the works for a 2.2-mile linear park with trails that will connect Georgia Gwinnett College with the downtown district. Lawrenceville is a diverse community where women outnumber men by four percent. Among the adult population, 55 percent has at least attended some college with 22 percent having earned at least a bachelor’s degree. The residents are evenly spread age-wise, with the largest population groups including seniors 65 and older, millennials aged 25-to-34, and children under 10 years of age, each group accounting for 14 percent of the population. In Lawrenceville, the median home income is $43,339, which is lower than the national average of $55,322. The median individual income is closer to the national average ($27,419), but it too is lower at $24,947. Unemployment in Lawrenceville is 5.7 percent, which is higher than the national average, currently at 3.8 percent. Lawrenceville is a great place to be if you love a variety of dining options. Most culinary options in the city range from cheap eats to moderately-priced restaurants, so dining out here won’t hurt your wallet. Some of the most popular places to eat include Local Republic, an American restaurant with a large selection of vegetarian and vegan options; Peachtree Café; Dominick’s for Italian food, and Athens Kouzzina in Sugarloaf Mills if you’re looking for Mediterranean/Greek food. Lawrenceville also has Medieval Times, the fun medieval-themed restaurant. Or, if you want great food at an even better price, then grab a pizza at Your Pie, some comfort food at Who’s Got Soul Southern Café, a bowl of pho at Saigon Café, or Caribbean/Jamaican dishes at Kingston 30. For the after work and weekend crowds, Lawrenceville has you covered. T-Ray’s Fire Grill is a steakhouse with some of the best cocktails in town. For a night of cool jazz and wine, you’ll want to go to Riley’s on the Square, while Tapas Bar & Lounge is the place for hookah and tasty tapas and wings. Other can’t-go-wrong choices include the Old Fountain Tavern in nearby Dacula, Oaxaca Tacos And Tequila Bar, and Will Henry’s Tavern, a popular sports bar in Stone Mountain with live music on most nights. Lawrenceville is rich with history, but that’s not all it has to offer. It also has excellent shopping, an incredible theatre, and more parks than you can imagine. Some of the historical landmarks in and around the city include the Historic Courthouse, Museum, and Grounds, Freeman’s Grist Mill and Park, the Lawrenceville Historic Cemetery, and the Fallen Heroes Memorial & Armed Forces Monument. For a year-long calendar of excellent performances, improv, comedy shows, kids’ shows, and more, Lawrenceville’s Aurora Theatre is where you’ll find them. There’s also ghost tours and the minor-league baseball team, The Gwinnett Stripers, to root for. For shopping, you’ll find plenty of deals and steals at Sugarloaf Mills, while nearby Buford has the Mall of Georgia and Atlanta has, of course, Atlanta Underground (currently under renovation), and so much more. Lawrenceville is a popular place for retirees to live because it has a mild climate, plenty of recreational opportunities, and good medical services. The Lawrenceville Senior Center is where local seniors have a safe and fun gathering place for enjoying planned activities such as exercising, arts and crafts, games, day trip, and more. Occasionally, special guests will perform and entertain or speak about medical, financial, and other issues important to seniors. Seniors also receive hot, balanced lunches during the weekdays. Seniors also have the benefit of having their medical needs seen to by the Gwinnett Medical Center, which is rated in the top 15 percent medical service providers in the U.S. Interested in receiving home trends updates sent directly to your inbox? Sign up today!